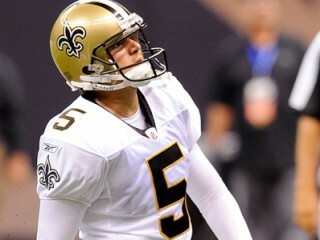 Garrett Hartley is an American football placekicker for the New Orleans Saints of the National Football League. He was signed by the Denver Broncos as an undrafted free agent in 2008. Hartley’s signing in October of 2008 proved to be a windfall for the Saints, solidifying the club’s kicking game. The strong-legged rookie didn’t miss a kick after joining the roster, making all 13 field goal attempts and 28 PATs. Although he did not appear in a game until December in 2009, Hartley did not disappoint in his sophomore season as he made 9-of11 attempts in the regular season. Enjoyed one of the most spectacular postseasons in NFL history by a kicker as he made all five playoff attempts, booting an overtime game-winner to send the Saints to the Super Bowl and becoming the first kicker in Super Bowl history to kick three field goals of 40 yards or longer. The former University of Oklahoma standout was initially signed as an undrafted free agent by the Denver Broncos and was inked by the Saints after a midseason tryout. NFL roster exemption lifted, 10/12/09; Reinstated by NFL Commisioner with one-week roster exemption, 10/5/09; Placed on NFL reserve/suspended list, 9/5/09; Signed by Saints, 10/29/08; Waived by Denver Broncos, 7/21/08; Signed by Denver as an undrafted free agent, 4/28/08. 2009- Took over kicking duties for the final five games of the season after being suspended for the first four and inactive for the next seven, going 9-for-11 on field goals and making 10 of 11 extra point kicks for 37 points. Suspended for the first four games of the season. vs. NY Giants (10/18): Inactive. at Miami (10/25): Inactive. vs. Atlanta (11/2): Inactive. vs. Carolina (11/8): Inactive with an ankle injury. at St. Louis (11/15): Inactive. at Tampa Bay (11/22): vs. New England (11/30): Inactive. at Washington (12/6): Playing for the first time on the season, kicked a career-best four field goals – including the 18-yard game-winner in overtime – in five attempts, with his only miss coming on a 58-yard attempt at the end of regulation that fell just short. at Atlanta (12/13): Kicked two field goals – of 33 and 38 yards – and was two-for-three on extra point kicks in the win. vs. Dallas (12/19): Was successful on his lone field goal attempt – a 34-yarder – and both PATs on the night. vs. Tampa Bay (12/27): Kicked two extra points and was one-for-two on field goals, making a 28-yarder and missing from 37 yards. at Carolina (1/3): Was successful on his only field goal try of the day and also on his only PAT kick. Assumed kickoff chores on the day and knocked one of three kickoffs into the end zone for a touchback. vs. Arizona (1/16 – Divisional Playoff): Converted all six extra point kicks and was successful on his lone field goal try, a 43-yarder, in the win. vs. Minnesota (1/24 – NFC Championship Game): Kicked four extra points in regulation and then sent the Saints to their first-ever Super Bowl when he split the uprights on a 40-yard field goal in overtime to provide the winning margin in the 31-28 victory. vs. Indianapolis (2/7 – Super Bowl XLIV): Contributed greatly to the team’s Super Bowl win, becoming the first kicker in Super Bowl history to kick three field goals of 40 yards or longer, connecting from 46, 44 and 47 yards and added two extra points. 2008 – Signed by the Saints, Oct. 29 and proceeded to have the finest season for field goal percentage by a rookie kicker in club history…Made all 13 field goal attempts and was 28 for 28 on PATs…Field goal total and 67 points are the second-highest total for a Saints rookie kicker, both records held by K Charlie Durkee in 1967 with 14 and 69 points… In NFL debut at Atlanta, Nov. 9, converted both of PAT attempts and 24 and 44-yard field goals…At Kansas City, Nov. 16, hit 30, 23 and 35-yard field attempts as well as all three PATs…Connected on all six of his extra point attempts, converted a 30-yard field goal attempt and booted three touchbacks vs. Green Bay, Nov. 24…Kicking in adverse weather conditions at Tampa Bay, Nov. 30, drilled a pair of 40-yard plus field goals, including a career-long 47-yarder…Was three-of-three on field goals (26, 46 and 25 yards) vs. Atlanta, Dec. 7…Had four touchbacks at Detroit, Dec. 21…Culminated a spotless kicking season in finale with four PATs and a 21-yard FG vs. Carolina, Dec. 28. Made a career-best 53-yarder vs. Utah State in his final season...Named a finalist for the Lou Groza Award as a junior, setting an Oklahoma-record with a .950 field goal percentage (19-of-20), totaling 31 touchbacks to pick up second-team All-Big 12 honors...Had 33 touchbacks as a sophomore…Majored in communications. Born May 16, 1986 in Keller, Texas… Prepped at Southlake Carroll (Southlake, Texas) HS...Made 17-of-20 FG attempts as a senior, earning all-state honors from the Dallas Morning News. View the full website biography of Garrett Hartley.